This article was written by Steve Estes, an ultimate player and organizer in New York City. Ultiworld’s coverage of the 2018 WFDF World Ultimate Club Championships is presented by VC Ultimate; all opinions are those of the authors. Please support the brands that make Ultiworld possible and shop at VC Ultimate! I know I’m not the only one who went on the emotional rollercoaster the last few days, from “I can’t believe the World Cup is over, now there’s no socially-acceptable way to avoid doing work!” to “Sweet Jesus, WUCC is giving me 20 free streamed club ultimate games a day, all week? !” But I soon knew I hadn’t actually died and gone to heaven, because the event format is entirely inscrutable. There is no Wikipedia page, like there is for the World Cup or Olympics or most big sporting events, that painstakingly details the event format and results. The tournament’s website has a “Competition” page that gives you the participating team names by pool, and nothing else, despite already telling us the teams elsewhere. The FAQ page misspells the word “questions” in its title, so I need hardly tell you that it’s singularly unhelpful to we spectators. Even the results page (on a bizarrely-separate site) looks like it was designed by a database administrator suffering a psychotic break, as its rambling list of games seemingly have team names removed, and records adjusted and reverted, almost at random. 8 pools of 5 teams each, named A through H. They each play 4 games, 2 per day. These happened Sunday and Monday; each pool held 5 of its games on each day, one on each of the 5 timeslots (9am, 11am, 1pm, 3pm, and 5pm ET). We have no information on tiebreakers, but we can assume it’s point differential and head-to-head, in some order. 1) The top two teams in each pool are placed into a “Power Pool,” of sorts, with letters I, J, K and L. It’s a pool of 4 teams, made up of the top 2 teams from each of 2 pools each… but you only play 2 games: the crossovers against the other neighboring pool. The top 2 teams in these “pools” get byes to the Round of 16, whereas the bottom two teams will have their tournament lives put at stake in a do-or-die crossover round on Wednesday with the next tier of pools. So for example in Women’s Pool D, Atlanta Ozone and Italy’s CUSB Shout have advanced to Power Pool L, where they will be joined by Pool F leaders Huck of Japan and Colombia AeroSoul. If either pool runner-up upsets the other pool winner (and then holds serve against the other runner-up), they’ll effectively take that pool winner’s automatic bid to the R16. 2) Teams finishing 3rd and 4th in each pool go into what I’ll call Purgatory Pools, lettered M, N, O and, you guessed it, P. You’re not relegated to the inferno, you can look up to see glory above you, and you’ve still got a chance to earn your way out of this mess. Like the Power Pools, in Purgatory you only play 2 games, against another pool’s middle-2 finishers, and if after that you are among the top 2 teams in this grouping, you have made it to a crossover game with a chance to steal a top team’s place in the Round of 16. The lower 2 places see you straight into the “C Bracket,” for 25th-to-40th place. 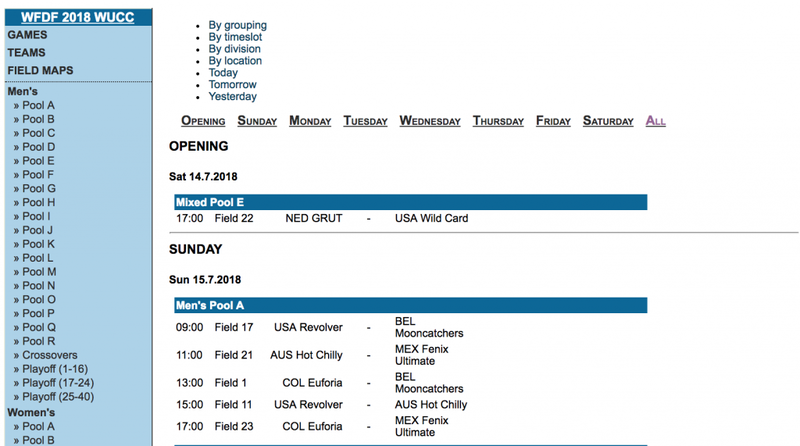 So on Tuesday (when both games of the second group stage are played), Men’s Pool M will be contested by Finland OTSO and Relámpagos of the Dominican, 3rd and 4th respectively in Pool B, and equivalents from Pool H, Singapore Crackerjacks and Switzerland’s FAB. Whoever does better on Tuesday will get a shot against a lower-half Power Pool team on Wednesday morning, and a chance to steal their spot in the big bracket. 3) Teams finishing 5th in each of the 8 pools get placed into pools Q and R, where they will play a full pool schedule of 3 games, two of them Tuesday and the third Wednesday morning. These games are mostly for seeding for the 25th-to-40th “C Bracket”. So while the top teams in the Power Pools sleep in on Wednesday, and the teams in the lower pools finish their 3rd pool game, it’s the upper half of the Purgatory Pools who get their shot at redemption. Top teams of the 4 Purgatory Pools face the bottom teams of the 4 Power Pools, and Purgatory runners-up face 3rd place teams from on high. Half play at 9am ET, the others at 11am ET. Winners reach the Round of 16; losers head to the B Bracket for 17th-to-24th place. Now things seem a little more familiar. It’s a 16-team bracket! Each team is guaranteed 4 games, as they sort themselves out. R16: Wednesday, 1pm and 3pm ET. QF: Thursday, 9am (2) and 11am (2). SF: Friday: Men play at 9am ET, Women at 11am ET. Finals: Saturday, Men at 10am ET, Women at 12:30pm. Placement games have 3 rounds: the first Thursday 9am ET, the second Thursday afternoon, and then the last game Friday morning. Mostly. With some exceptions. QF: Thursday, 11am (2) and 1pm (2). SF: Thursday, 3pm (1) and 5pm (3). The placement for teams 25th-to-40th isn’t that different from the Championship bracket, in that everyone gets 4 games, and those end up sorting you. R16: 3rd or 4th-placed finishers from the Purgatory Pools are each met by a team from the lower pools, on Weds at 1pm (4) and 3pm (4). QF: R16 winners play at 11am Thursday (4), R16 losers at 1pm Thursday (4). SF: Again on Thursday, those who played QFs at 11am play at 3pm, those from the 1pm games play at 5pm. Finals: Friday morning, half at 9am the other half at 11am. 48 teams, and a lot simpler than the others. Teams are divided into 8 pools of 6 teams each, named A through H. All teams of a pool play at the same time, 2 games a day, though those times may differ. Tuesday morning sees the final round of pool play; 4 pools play final games at 9am, 2 more at 11am, and 2 (pools B and H) wait until 1pm to play. Tuesday afternoon sees the top 3 teams in each Hex group getting a bye, while the others have work to do. 6th-place: The final team in each bracket plays a crossover game, which is ultimately meaningless as to placement. Why not give them a rest, like the top 24 teams? We can only presume the TD read the Book of Job prior to designing this schedule. We end up with a 32-team championship bracket, single elimination, no shockers. R32: Weds, 11am (8) and 1pm (8). Group winners play 4th-vs-5th-game winners. Group runners-up play 3rd-place teams. R16: Weds, 3pm (4) and 5pm (4), plus placement games equal in time and quantity. QF: Thurs, 11am (2) and 1pm (2). SF: Friday (! ), 1pm, with losers here playing the 3rd place game at 5pm. F: Saturday, 3pm, at the stadium. Placement games occur at the same times on Weds, but double up on Thursday (placement semis are half at 1pm and half at 3pm, except for the QF losers, who play at 5pm). Final placement games are on Friday, mostly at 9am and 11am ET. Places 33rd through 48th are decided by a 16-team, 4-game bracket, much the same as the Men’s and Women’s divisions. R16: Weds, at 11am (4), 1pm (2) and 3pm (2), pairing 4th-vs-5th losers against one of the 6th-place teams from pool play. QF: Thursday, 9am (4) and 11am (4). SF: Thursday, 3pm (4) and 5pm (4). F: Friday, 11am (4) and 1pm (4). I hope this helps you all enjoy the rare spectacle you’re seeing this week, just a little bit more. And of course, follow all the Ultiworld livestreaming action from the schedule or the live page. Comments on "Explaining the Format of the World Ultimate Club Championships"